Update: We've had confirmation from Sony that the Xperia L1 price is £169.99 (around $210, AU$270). 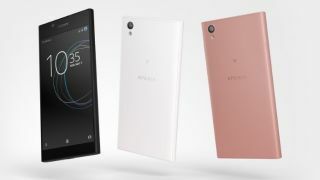 Sony’s only just launched the powerful Sony Xperia XZ Premium, but it's not done with the releases: out of nowhere it’s announced the Sony Xperia L1 - a big screen phone with an eye-catching price tag. Highlights include a 5.5-inch 720p display, an 'efficient' chipset and smart software features working in the background to improve the your time spent interacting with the big-screen handset. The Sony Xperia L1 will be launching in late April, but in the meantime, here’s everything you need to know about it. The Sony Xperia L1 will be launching in late April in the UK and across select markets in Europe, North America, Latin America, Asia, the Middle East and Africa. Exact countries (other than the UK) and dates haven’t yet been revealed, but we’ll be sure to let you know as soon as we hear anything. We've had confirmation of the Sony Xperia L1 price, with an RRP of £169.99 (around $210, AU$270) attached to the handset making it comfortably affordable. The Sony Xperia L1 has a big 5.5-inch 720p screen, wrapped up in a 151 x 74 x 8.7mm body. It’s a fairly typical Sony design, with a very rectangular shape and a plain back in black, white or pink. But the edges are rounded to make the Xperia L1 more comfortable to hold, and although there are large bezels above and below the screen there’s little frame at the sides, giving the display a greater edge-to-edge look. There Xperia L1 camera setup consists of a 13MP rear camera and a 5MP wide-angle front-facing sensor, which is a fairly standard low to mid-range specification. The battery is perhaps more interesting, as while it’s not enormous at 2,620mAh it features Qnovo adaptive charging. This is a technology we’ve seen on other Sony phones, and it not only charges quickly, but also does so intelligently by monitoring the condition of the battery and adjusting charging currents as needed to maintain its health, so it doesn’t wear out as quickly. The Xperia L1 also plugs in via USB Type-C, which means you can connect the charging cable either way around. The Sony Xperia L1 has a 1.45GHz quad-core MediaTek chipset coupled with 2GB of RAM. That’s a fairly low-end spec, but despite that Sony claims the phone offers 'smooth performance'. It supports 4G and NFC, runs Android Nougat, so it’s up to date there, and it has 16GB of storage plus a microSD card slot with support for cards of up to 256GB. It’s with the software that the Sony Xperia L1 might really stand out from other low to mid-range phones, offering enhanced functionality that those spending a little less on their phone might not readily expect. There’s ‘Xperia Actions’ for one, which aims to adapt the phone’s settings and functionality based on your environment. For example, it will lower the screen brightness and set the phone to ‘Do not disturb’ mode when you’re likely to be asleep, based on its learning of your behaviours. ‘Smart Cleaner’ meanwhile will work in the background to automatically remove cached data and unused processes, thereby improving performance. The Sony Xperia XA1 could be a good alternative if you're happy to spend a tiny bit more cash.